Korean special-effects-laden horror with comedic overtones sees dysfunctional family united in opposition to a gruesome foe from parts unknown. The Parks are an average suburban Seoul family; Park Senior, in his 60's, runs a kiosk by the Han River; his eldest son is a bit of a waste of skin whose wife has left him years ago with a young daughter; his younger son is a layabout with no intention of working; his daughter alone makes him proud - an prizewinning archer of note. Granddaughter little Hyun-Seo is the apple of everyone's eye so when she's abducted by a horrible monster that emerges from the depths of the Han one day, the family is righteously upset. The prospective loss of the only thing holding them all together, galvanizes them into a monster-hunting posse extraordinaire and off they go to slay the dreadful beast. 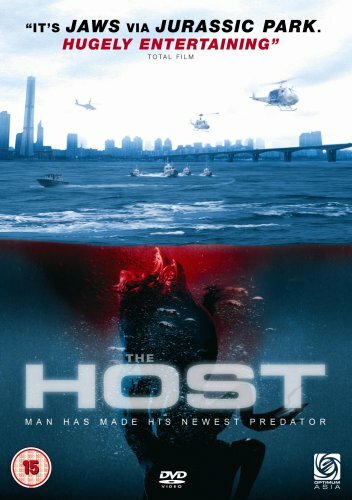 Korean special-effects-laden horror with comedic overtones sees dysfunctional family united in opposition to a gruesome foe from parts unknown. The Parks are an average suburban Seoul family; Park Senior, in his 60's, runs a kiosk by the Han River; his eldest son is a bit of a waste of skin whose wife has left him years ago with a young daughter; his younger son is a layabout with no intention of working; his daughter alone makes him proud - an prizewinning archer of note. Granddaughter little Hyun-Seo is the apple of everyone's eye so when she's abducted by a horrible monster that emerges from the depths of the Han one day, the family is righteously upset. The prospective loss of the only thing holding them all together, galvanizes them into a monster-hunting posse extraordinaire and off they go to slay the dreadful beast.